A Russian choir sings and wax tapers cast a soft glow as Tessa Piggott says 'I do' to Frank Carver in Love Hurts, BBC 1's saga of grown-up love. 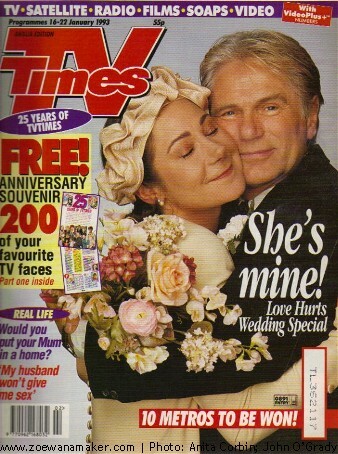 It takes a dangerous adventure on a business trip to Russia to bring Frank (Adam Faith) and the supremely independent Tessa (Zoe Wanamaker) together for their spur-of-the-moment wedding. And although there are no guests and no honeymoon, the ceremony in St Isaac's, a beautiful cathedral in the historic city of St Petersburg, couldn't have been more special. 'It was a very romantic moment in a glorious setting,' says Zoe. The walls of the church were covered in marble and lapis lazuli, which reflected the light of the flickering candles. Yet Frank and Tessa's wedding also had its funny moments. Because the crew was granted only a few hours' access to the building, both rehearsals and filming had to be done at breakneck speed. A priest who turned up unannounced kept interrupting when he thought things weren't being done properly. And during one touching moment, Adam managed to singe the mysterious priest's beard with one of the candles! But marriage is unlikely to turn the volatile relationship between Tessa, who's never been wed before, and the once-married Frank into one of comfortable domesticity. Much of Love Hurts' success can be put down to the attraction of opposites, which both Zoe, 43, and Adam, 52, admit reflects the chalk-and-cheese relationship they have as actors. They had not met before they were cast in the series - but now they're clearly good friends. Yet their first meeting almost got off on the wrong footing. Says Zoe: 'I've always thought that the better-looking a man is the more he's to be avoided. If they're pretty, you either fall deeply in love with them and feel inadequately matched - or they're a pain in the bum. 'And here was Adam, this classically beautiful pop star, whose records I used to dance to, whose poster hung on my friend's bedroom wall, sitting across the table from me at lunch and hardly saying a word. It's said as a joke, but you get the feeling that Zoe is a touch defensive that her elfin face, with its snub nose and striking eyes, doesn't conform to conventional ideas about actresses' beauty. Adam's own real-life wedding to former dancer Jackie at London's Caxton Hall 25 years ago couldn't have been more different to Frank and Tessa's. The ceremony was besieged by hundreds of Adam's fans wanting to wish their pop hero well. The couple have one daughter, Katya, who is studying history at Harvard University in America. For Zoe there has been no real-life marriage, despite several long-term relationships. 'I've been wary of committing myself to one person for the rest of my life,' she says. 'I've been close, but I've always baulked at the final hurdle. It's a very confusing issue which I still haven't resolved. 'My relationships were like marriages. You set up a home together, you share belongings, memories, photograph albums. And when you break up, there's a lot of regret... a lot of pain. Zoe, whose father is the American actor and film director Sam Wanamaker, was born in New York and arrived in Britain to stay at the age of three - her family fled the McCarthy communist witch-hunt of the Fifties. In the 20-odd years she's been a professional actress she has established an enviable reputation in socially committed dramas and the classics. But it has taken Love Hurts, created by Laurence Marks and Maurice Gran, finally to turn her into a star. And although this state of affairs is welcome, she's still trying to get used to the public recognition that goes with it. 'As a child walking down the street with my father, people would recognise him and say, "Hi, Sam!". I found it so embarrassing I'd hide in corners,' she says. 'I didn't want people to notice me. Even at drama school I'd hide behind the radiator. As a former pop idol turned businessman, actor and columnist, he's thrilled that his first major television role since Budgie in the Seventies has proved to be such a success. 'It would have been an anti-climax to come back to something that wasn't, although to be honest, I didn't have too many expectations,' he says. Frank and Tessa's wedding takes place in glorious St Isaac's, the world's third largest domed cathedral after St Peter's in Rome and St Paul's in London. St Isaac's, a museum for decades, was easier to hire for filming than one of the handful of churches that continued to function throughout the Communist rule. 'It was such a struggle for Christians to survive, so the idea of filming in a church still being used for worship seemed almost blasphemous to them,' says producer Tara Prem. Because Frank and Tessa marry on the spur of the moment, they only have 48 hours to organise the ceremony. Tessa employs a local seamstress to make her dress. In reality, Zoe's long, simply styled, off-white wedding dress was supplied by the costume department.